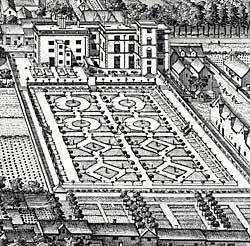 The formal gardens of Pierrepont House, Nottingham, c. 1720. Nottinghamshire has a strong horticultural tradition going back to the creation of the 'Dukeries' in the north of the county in the 17th and 18th centuries. Many of the houses associated with the landed gentry had formal gardens characterised by clipped yews and box, mazes and topiary, as well as having more 'natural' landscapes constructed on a vast scale. The English landscape architect Humphry Repton (1752-1818) was popular in Nottinghamshire. By 1791 he had been consulted at a number of places in the county, including Welbeck, Babworth, Grove and Thoresby, where he introduced terraces and parterres between the house and the wider landscape. Some of the most important gardens historically in Nottinghamshire, such as those at Shireoaks Hall (designed by Sir Thomas Hewett) and Worksop Manor (designed by Lord Petre) have all but long since disappeared. The 19th century brought with it a new appreciation of plants and a move towards the cottage garden. During the 1830s and 1840s the interest in filling the garden with masses of bright colours became dominant. By the 1860s Nottingham was renowned for its gardens and by 1867 there were over 10,000 allotments in existence in the town. The Nottingham Arboretum, designed by the London botanist Samuel Curtis, was opened in 1852 as a kind of botanical garden with an educational object. Specimens of all the hardy trees thought capable of surviving the English climate were placed in their families, ranged in the order followed at Derby Arboretum. Flower borders were an original feature of the Arboretum and included plantings of subtropical species in the summer. In 1869 Reverend Samuel Reynolds Hole of Caunton Manor, near Newark, published A book about roses, which was the catalyst for the popularity of rose-growing in the county. The City of Nottingham Parks Department published its first catalogue of trees and shrubs growing in the public parks in 1924 and in 1926 Robert Mellors published his book on the gardens, parks and walks in Nottingham and district. Both helped to stimulate the public's interest in gardens. 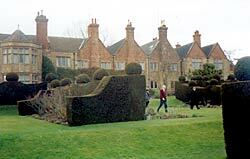 The gardens at Felley Priory. Today Nottinghamshire has a wide diversity of gardens to offer, from the more traditional and formal gardens such as those at Newstead Abbey and Holme Pierrepont Hall, to the more modern gardens such as the Millennium Garden at the University of Nottingham and the Japanese garden at North Clifton. Many of these are featured in Philip Jones' book Great Nottinghamshire Gardens (Nottinghamshire County Council, 2001). Information about other more private gardens in the county equally worthy of a visit can be found in the annual publication Gardens of England and Wales Open for Charity, the 'yellow book' published by the National Gardens Scheme Charitable Trust. James Orange was the independent minister of Barker Gate Chapel. Writing in 1840 he made a powerful case for the provision of allotments for poorer working class families, to ease the problem of unemployment due to trade depression, particularly in the framework knitting trade. Some private landowners, including the Duke of Portland and Earl Manvers supported his scheme and land for allotments was acquired in Basford, Sutton in Ashfield, Arnold and Carlton. In Nottingham itself little progress was made before the Enclosure Act 1845 made land available. Before that time the only allotments available were let by the Corporation to better off tradesmen at profitable rates. However by 1853 there were some 7,000 gardens in and around Nottingham. Extract from the plan of Marshall Tallard's garden at Newdigate House, Nottingham, (1705). English Heritage, National Monuments Record Centre, Kemble Drive, Swindon SN2 2GZ, maintains the National Archaeological Record, including written reports and surveys, the record files of the Royal Commission on Historical Monuments of England, the National Library of Air Photographs, and the Register of Parks and Gardens of Special Historic Interest in England (one volume per county, 1984 onwards). Royal Horticultural Society, Lindley Library, 80 Vincent Square, London SW1P 2PE, is the world's leading horticultural organisation with its own archives, including sets of gardening magazines such as The Gardener's Magazine and The Gardener's Chronicle. Nottinghamshire Archives, Castle meadow Road, Nottingham NG2 1AG, has a good collection of estate, enclosure, tithe and Ordnance Survey maps, all of which may help in tracing the development of parks and gardens in the county. The Local Studies Library, Central Library, Angel Row, Nottingham NG1 5HP has a fairly comprehensive collection of prints, drawings, photographs and sale particulars relating to many of the substantial houses in the county and their gardens. Picture the Past is a joint project by the local authorities of Nottingham, Nottinghamshire, Derby and Derbyshire, to conserve and make publicly accessible the photographic heritage of the North East Midlands. It contains images of gardens, especially those associated with larger country houses. National Trust. The Kitchen Garden, Clumber Park (2002). Nottinghamshire Historic Gardens Trust, 6 Highfield Road, West Bridgford, Nottingham NG2 6DT. To arrange tours of the St Ann's Allotments (Hungerhill Gardens) please contact mo_heritage@staa-allotments.org.uk or telephone 0115 911 0207.